The Rev. 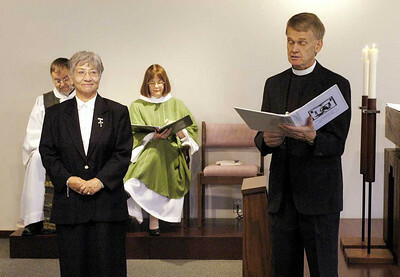 Stanley N. Olson (right), executive director, ELCA Division for Ministry, reads from the Service of Installation and Covenanting, presenting Sister E. Anne Keffer (left) as directing deaconess, Deaconess Community of the ELCA. The Rev. Raymond L. Schultz, national bishop, Evangelical Lutheran Church in Canada, and the Rev. Rebecca S. Larson, executive director, ELCA Division for Church in Society, are seated in the background. Sister E. Anne Keffer acknowledges the congregation during her installation as directing deaconess, Deaconess Community of the ELCA. The Rev. Raymond L. Schultz, national bishop, Evangelical Lutheran Church in Canada, and the Rev. Rebecca S. Larson, executive director, ELCA Division for Church in Society, participate in the liturgy. The Rev. 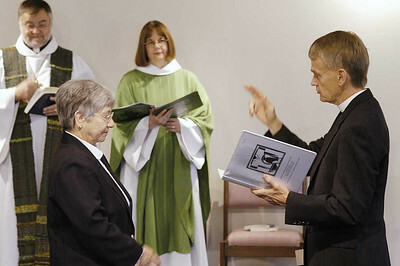 Stanley N. Olson (right), executive director, ELCA Division for Ministry, makes the sign of the cross as he installs Sister E. Anne Keffer (foreground left) as directing deaconess, Deaconess Community of the ELCA. The Rev. Raymond L. Schultz, national bishop, Evangelical Lutheran Church in Canada, and the Rev. Rebecca S. Larson, executive director, ELCA Division for Church in Society, stand in the background. "May she do justice, love kindness and walk humbly with you," the Rev. 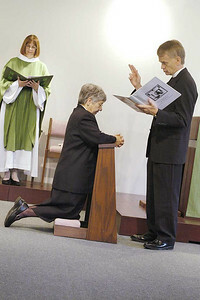 Stanley N. Olson (right), executive director, ELCA Division for Ministry, prays as he installs Sister E. Anne Keffer (kneeling) as directing deaconess, Deaconess Community of the ELCA. The Rev. Raymond L. Schultz, national bishop, Evangelical Lutheran Church in Canada, and the Rev. Rebecca S. Larson, executive director, ELCA Division for Church in Society, stand in the background. "Almighty God guide, bless and keep you, that you may be faithful in the ministry to which you have been called and consecrated," the Rev. 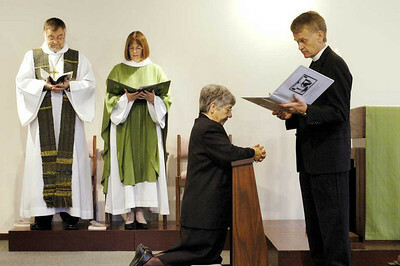 Stanley N. Olson (right), executive director, ELCA Division for Ministry, prays as he installs Sister E. Anne Keffer (kneeling) as directing deaconess, Deaconess Community of the ELCA. The Rev. Rebecca S. Larson, executive director, ELCA Division for Church in Society, stands in the background. 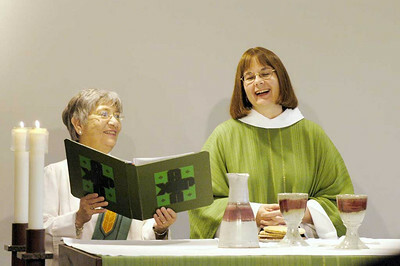 Sister E. Anne Keffer (left), directing deaconess, Deaconess Community of the ELCA, assists as the Rev. 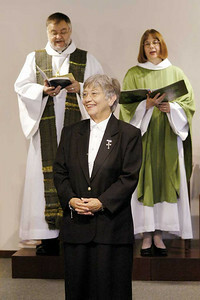 Rebecca S. Larson, executive director, ELCA Division for Church in Society, presides at the sacrament of Holy Communion. 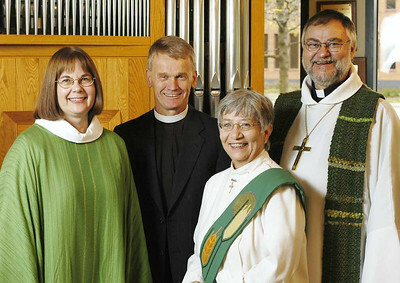 Left to right: The Rev. Rebecca S. Larson, executive director, ELCA Division for Church in Society; the Rev. Stanley N. Olson, executive director, ELCA Division for Ministry; Sister E. Anne Keffer, directing deaconess, Deaconess Community of the ELCA: and the Rev. Raymond L. Schultz, national bishop, Evangelical Lutheran Church in Canada. Left to right: The Rev. 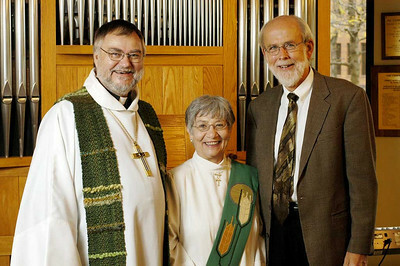 Raymond L. Schultz, national bishop, Evangelical Lutheran Church in Canada; Sister E. Anne Keffer, directing deaconess, Deaconess Community of the ELCA; and the Rev. Mark S. Hanson, presiding bishop, Evangelical Lutheran Church in America.